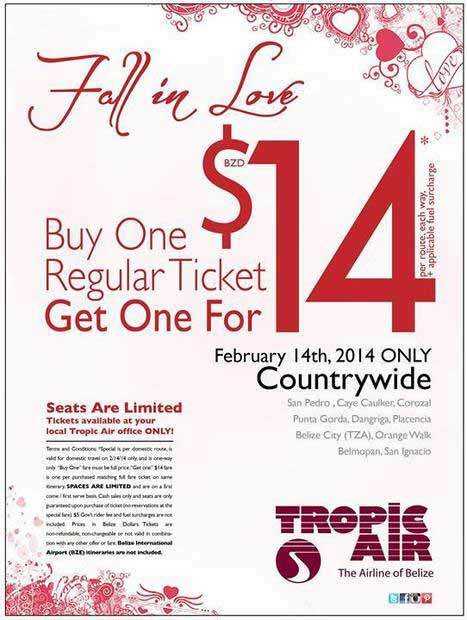 Valentine's Day is almost here, and Tropic Air is offering a special where if you buy one ticket at regular price, you get a second ticket for only $14. It's for flights on Valentine's Day only, and is country wide. "As promised, here it is! We are giving you a week to plan your very special Valentine's Day. Tickets are limited, do not include Belize International (BZE) itineraries, and will sell out fast, so book early. Other restrictions do apply. Contact Tropic Air Belize stations or [email protected] for the details. "